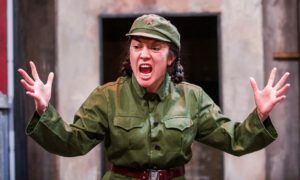 This epic play spanning over 60 years of Chinese history from the Maoist revolution to the present day is the culmination of nearly a decade of study and tells the story of the real people. I play Tang, the no-nonsense communist soldier who brings grassroots change to Rotten Peach Village. It is a very moving piece about how people were empowered to create real change for themselves but how corruption and the struggle for power and results led to the famines of the Great Leap Forward and eventually set the nation on the road to extreme capitalism. I felt very humbled to tell these women’s stories and honoured to be part of a production that had so much heart and humour. The Arcola Theatre and later the Jubilee Hall in Aldeburgh were transformed by Lily Arnold into a Chinese Temple. Take a look at the stunning cast photos by Nobby Clark on the HighTide website.